Cancer is the leading cause of death in Canada and, with cancer rates rising, the health care system is under continual pressure to provide high-quality care to rising numbers of patients. To support patients and their families in receiving whole-person cancer care, the system requires a deep understanding of what matters to patients in their care and how the current system is experienced by patients. In summer 2018, the Council received a request from the Ministry of Health to help inform whole-person cancer care and improve transitions for persons receiving cancer treatment in British Columbia. 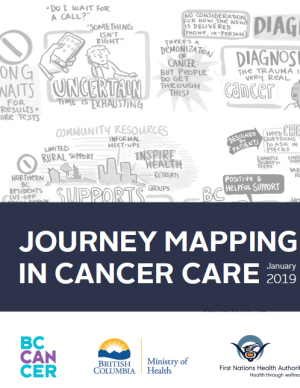 In partnership with BC Cancer and the First Nations Health Authority, three journey mapping sessions were held in October and November to gather information from patients, family members and providers. 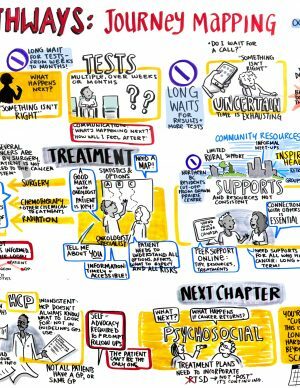 The goals of the sessions were to inform whole-person cancer care throughout the entire care experience and improve transitions for patients receiving cancer treatment in British Columbia.